This post is about the best things to do in Paracas. Paracas is the centre of adventure tourism in Ica. A beautiful region just south of Lima that is unlike any other place in Peru. The deep blue sea contrasted stark with the bright yellow desert all around me. I walked on the dark brown sand of the beach to keep warm, but still I was shivering in the strong wind. I have to remind myself that I am still in Peru. After all, I came here in search of old Inca ruins in the jungle, but here I was in the desert in Ica near Paracas. For the adventurous soul it turned out there were a lot of things to do in Paracas. Like most tourists, my first plan was to take a direct bus to Arequipa and then Cusco to visit the famous Machu Pichu. But then I read something about Ica. A province south of Lima that is probably Peru’s best kept secret. For now, because it’s city Paracas is becoming more popular. One of the things to do in Paracas is Islas Ballistas where you can see sea lions and penguins. It was the main reason for me to visit Ica, but I enjoyed all the other things to do in Paracas just as much. My first stop was the small beach town of Paracas. I stayed in the famous Kokopelli hostel with a pool, but unfortunately it was still too cold to swim. The quiet town was not particularly nice. Besides the boulevard there is not much to do. The sunset was beautiful, but still I felt a bit disappointed on my first day in Ica. Nothing here gave me any indication of the beauty outside of Paracas town. The next day I had to get up early for my tour to Islas Ballestas, one of the top things to do in Paracas. These islands are a dream for biologists due to its rich biodiversity of marine life and birds. They are also called the poor man’s Galapagos and tours here will cost you only 15$. We had to wait in line and were then divided among several speedboats. The tours are quite proffesional and every speed boat has its own guide. On the rough sea our guide pointed out the Candelabra. It’s a mysterious drawing of a trident made in the hills overlooking the ocean. My first idea is that it is probably connected to the famous Nazca lines further south, but according to our guide the Candelabra is believed to be much older. In fact, it is more than 2000 years old. The meaning and purpose of it remain unknown. I can only be amazed by the size of it and that these lines have remained all these years in the sand, despite erosion and sandstorms common in the area. My main reason to visit Ica was the possibility to see wildlife. Islas Ballestas did not disappoint me in that regard. After the Candelabra our boat speeded towards a group of rocks inhabited by thousands of birds and the occasional group of sea lions. The birds are everywhere and the rocks are covered in their poo. I got really excited when our guide pointed out three small penguins among the pelicans. A moment later I spotted my first sea lion sleeping on a rock and soon we saw several groups of them lying around. My visit to Islas Ballestas alone made my stop in Ica worth the effort to come here. I didn’t expect much of the Paracas Natural Reserve, but my visit there really surprised me too. We made stops on several beaches such as Playa Roja and Bahia Lagunillas. I was mesmerized by the colors. The deep blue sky, the dark brown sand of the beach and the bright yellow desert make this a place out of this world. It felt almost surreal to be there and the colors kept changing with the clouds passing by. If you are in Paracas don’t miss the Paracas Natural Reserve. It certainly is one of the most beautiful things to do in Paracas. There was more desert at our final stop in Huacachina, a small oasis town catering to both local and foreign tourists who come here for adventure. Huacachina certainly is one of the most adventurous things to do near Paracas. Every evening you can take a tour to the desert in a buggy to go sand boarding. For only 15$ I did not want to miss out on this. Despite travelling all over the world, I am actually not that adventurous. My fears include big insects, height and speed. I was not sure what I was expecting, but the sandbuggying didn’t sound scary to me. I thought it would be a gentle ride through the desert. Peru isn’t really famous for its sand dunes, so how high can they really be? At a normal speed, we were driving out of the small oasis town. The scenery was amazing. That was when our driver gestured to us to securely fasten our seatbelts. After that, he continued on full speed driving up and down sand dunes like a roller coaster. The next day I feel somewhat ashamed for my fears. Several schools made Huacachina the place for a school trip. Hundreds of kids are having fun with their sand boards sliding down the dunes while I enjoy watching them from a distance as I am waiting for the bus to Arequipa. Pisco is a Peruvian alcoholic drink and a local speciality in Ica. It was in the 16th and 17th century that Ica had the largest vineyards in Peru. Some of them are still active and open to visitors where you will get to taste a variety of Pisco. I had already tasted Pisco sour in Lima. The famous combination of pisco with lemon juice. Little did I know that there is so much more to Pisco. Kokopelli Backpackers Hostel is a trendy hostel with a pool right at the beach and a free breakfast. What else do you need? Casa Bamboo is a more quiet option in Huacachina with an excellent restaurant. If you want to party and/or a pool there are plenty of other places in town. If you want a good night of sleep come here. From Lima it is about 4 hours by bus to Paracas. Direct local buses to Paracas are rare. To reach Paracas you can take a bus heading south to Ica and ask to go out in the town Santa Cruz. From there you can take a taxi to Paracas. Several companies that are slightly more expensive than a local bus do have direct buses from Lima to Paracas. Check Peru bus, Cruz del sur, Peru hop, Green toad bus and Oltursa. Paracas is the base town where you can organize your tour to Islas Ballestas and the Paracas Natural Reserve. The Islas Ballestas tours are available from $15 dollar onwards. To reach Huacachina you can take a local bus from either Lima or Paracas to the town of Ica and from there take a taxi to Huacachina. 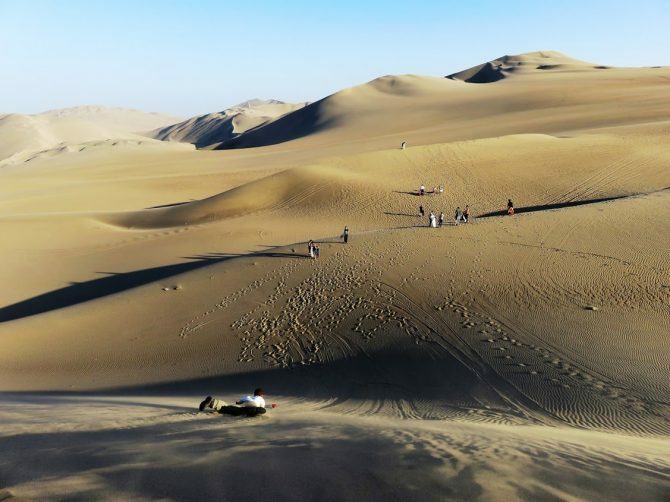 In Huacachina you can organise the sandboarding tours starting at $15 dollar. Peru hop offers a convenient hop on hop off bus package going directly to Paracas and Huacachina, even delivering you and picking you up from your hostel. On top of that, they offer a free visit to the Paracas Natural Reserve and a Pisco vineyard. You can read about my experience with Peru hop in my Peru hop review. My next stop with them was in Arequipa where I did the Colca Canyon trek. We had an awesome time in Ica and Huacachina! I was terrified on the sand dunes too. The jeep was horrifying and I didn’t get up the courage to sandboard either lol. It’s too bad you didn’t get a chance to tour some Pisco wineries! That was a highlight of our time there. Oh and do you guys eat any chocotejas? They’re a local specialty and SOOOOO good!